On February 29th, we enjoy the extra “Leap Day”, and on that occasion, I will take the tour past the scene of Charleston’s most famous leap, made in 1780 by Francis Marion. The Spring of 1780 saw Charleston (Charles Town until 1783) under siege by British forces on land and at sea. Marion was a Colonel in the 2nd South Carolina Regiment defending the city, and took time away from his duties one evening to attend an officer’s gathering at the John Stuart House on Tradd Street. The officer hosting the affair began offering toasts to be drunk, which put Marion in an awkward position. Marion’s influence on the outcome of the war was significant as the British eventually gave up South Carolina, as Lord Cornwallis marched his troops North to Yorktown in 1781, and the final disastrous Red Coat defeat. Thank you Francis Marion, for making your historic leap. People on the tour are often traveling south to Savannah and ask about points of interest along the way. One such place is the town of Beaufort, which just celebrated its 300th birthday in 2011, the second oldest town in South Carolina behind Charleston. The town is located along the picturesque Beaufort River, about an hour and a half drive from Charleston down US 17 South to US 21 east. The riverfront area is lined with grand antebellum mansions, such as the 1810 “Secession House”, while the area features authentic museum buildings such as the 1805 Verdier House, as well as historic fortifications, such as colonial Fort Frederick, built of rustic “tabby” in 1726. 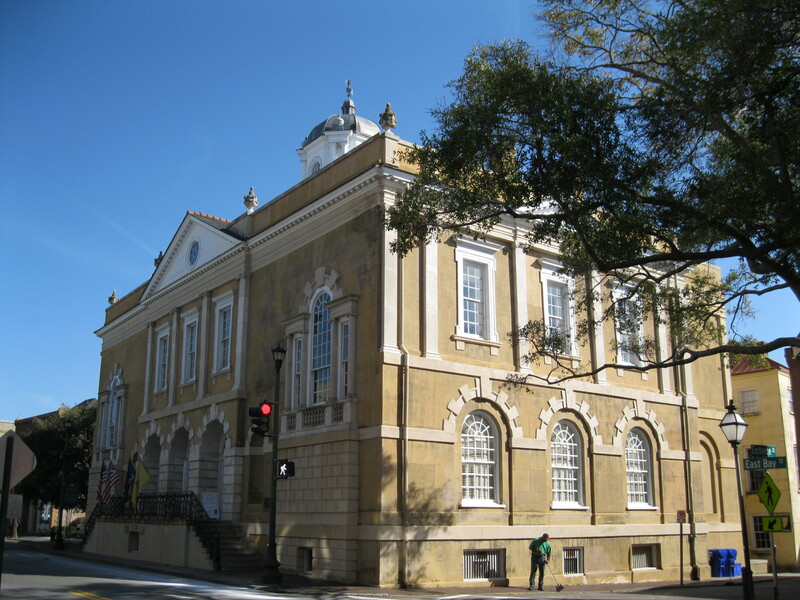 Nearby St. Helena Island features the famous Penn Center, which originated as a school for former slaves and now offers a wealth of displays on the African influence on early South Carolina history, and the contributions of their descendants in shaping this former plantation island. This tiny community is still called Frogmore by some, and was home to the delicious seafood concoction known as Frogmore Stew. Down the road from St. Helena, Hunting Island State Park is worth a visit for its incredible lighthouse grounds that are open to the public. Visitors can scale the 175 steps to witness the breathtaking views of South Carolina’s coast and understand how this remarkable structure was built with movable parts in 1875, so that it could be dismantled and rebuilt fourteen years later when the ocean threatened to sweep it away. Turning back down the road to Savannah along US 17 South, it is worth a small detour down Old Sheldon Church Road to the ruins of the Greek Revival Church that was burned by both the British and Federal forces during the Revolution and The Civil War. Old Sheldon Church still lends a gracious beauty to the pristine forest area, and is so stunning that it is still used for Easter services each year despite its crumbling walls. Interesting flags have always decorated historic Charleston, and several home and building owners show their colors on a regular basis with banners that test the knowledge of those who pass by. At 36 Meeting Street, the owner flies and assortment of interesting flags, including the “Fort McHenry Flag”. This version of the stars and stripes was the flag that inspired Francis Scott Key to write our national anthem, and is the only version of the official US flag with fifteen stripes. Over at 100 Tradd Street, the owner flies a “Bonnie Blue Flag”, a blue banner with a single star that was a symbol of independence among southerners flighting against Spanish rule in Alabama and Florida in 1818. It became a famous symbol of the Confederacy after New Orleans native Harry McCarthy created the famous Bonnie Blue Flag song during the War Between the States. At 3 Water Street, a friend of mine occasionally flies his “Gonzalez Flag”, featuring the symbol of a cannon, a single star, and the saying “come and take it”. It commemorates the town of Gonzalez, Texas, where during the suzerainty of Mexico, the community was given a cannon to fight off hostile Indians. When Gonzalez got involved in the Texian independence movement began, the Mexican government demanded the gun back, and the defiant town created the flag. At 59 Meeting Street, a very unusual banner flies with stars and stripes in reverse color from the US flag. This is the “Guilford Courthouse Flag” flown in the Revolutionary War battle at that town in 1781. At 24 Church Street, the owner flies an assortment of colorful banners, including “Big Red”. This version of our state flag includes the palmetto tree and gorget crescent on a red field, indicative of the artillery unit from the Citadel who showed this flag when firing on the USS Star of the West when that ship tried to resupply Fort Sumter in January, 1861. People often refer to the four-wheeled tourist vehicles pulled by teams of horses and mules as “carriages”, but that is technically not correct. Such vehicles used for hauling heavy loads (in this case up to 16 passengers and driver) are really wagons, while carriages are actually the more ornate and more private animal-drawn vehicles. We have both clip-clopping down the historic streets of Charleston, and all pulled by critters with leather “diapers” attached to the rear end to help keep streets cleaner. Today, there are five wagon and carriage companies and three driven routes featuring dozens of vehicles, but when I was growing up on Legare Street in the sixties, there was only one. It was a fine carriage driven by an older Austrian gentleman with the most appropriate name, Mr. Waggoner, and it was an enjoyable sight to see him, dressed with riding jacket, buggy whip and tie, taking the occasional tourist couple down the streets of Charleston. Nowadays with so many animals on the streets, there is sometimes congestion and complaint, but Charlestonians should remember that horses and mules have long plied the streets, pulling cotton drays, ice wagons, and exquisite carriages. In 1866, tracks were laid in select streets for trolleys that were pulled by draft animals until they were electrically charged in 1897, and full-service livery stables existed all around the historic city as late as the 1930’s. Author adminPosted on February 19, 2012 Categories UncategorizedLeave a comment on Carriages or Wagons? 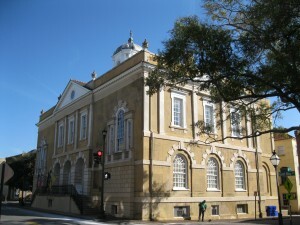 The Old Exchange Museum is a spectacular introduction to Charleston’s past, and once was the first building in full view for sailing ships entering the harbor. The property was originally on the waterfront, and included a tactically-important part of the original city wall called the Crescent Moon battery. By the early 1700’s a guard house was plced on the spot, and here dozens of pirates held prisoner in 1718, including the famed “gentleman pirate” Stede Bonnet, who was hanged the same year. Replacing the guard house in 1767 was as a Custom House finished in 1771, featuring exquisite Palladian details in its Neoclassical structure. Built on a raised basement that included a storage area for incoming goods, the building offered a merchants floor as well as offices for customs officials on the second tier. The Exchange was commandeered by occupying British troops in 1780, who used its basement as a jail for American patriots who included two signers of the Declaration of Independence, Thomas Heyward Jr. and Edward Rutledge. In the early 20th century, the building was saved from demolition by the Daughters of the Revolution, and today it is a city museum. When archeological work was being done on and around the building in the 1970’s, oyster shells were found in the spaces between the upper floors. Had the tide risen that high at one time? No, these were just the remnants of the builders’ lunch in the 1760’s. Charleston has always been a natural garden, and some of the plants that have grown here or were introduced from other areas have some peculiar nicknames and histories. The “popcorn tree” is very common, a nickname for the Chinsese Tallow tree. It’s berries are waxy-colored and look like popcorn and thus the name. They were once used for making candles, but today the berries are commonly woven into sweetgrass baskets by the weavers along city sidewalks. The “cast iron plant” is the nickname for another Asian species, the Aspidistra. This wide-leafed plant grows well in sunless areas and with little water and thus the monicker that suggests it will survive anything. “Stinkweed” was perhaps the most colorful name for a Charleston bush, referring to the odiferous Jimson Weed that was once found growing wild on the Charleston peninsula. The Jimson Weed is toxic to animals, and an city ordinance passed in the 18th century required people to remove it from their property. For the initial settlers of the Charleston area, finding fresh water was easy – all you had to do was dig, and not very deep. The peninsula lies atop a 18-20 foot strata of sandy soil that underneath has bed of hardened clay marl impervious to water, and soaking rains fill this strata enough that a twelve-foot well should provide plenty of water. A water problem emerged with population growth and pollution, as wells on adjacent lots competed for the same water, while outhouses drains dumped harmful bacteria into the water system. By the 1820’s steam technology and improved digging implements allowed for probing through the marl into the ancient aquifers deep in the substrata of the coastal plain. There, tons of water flows daily, creating enough pressure to create springs where the layers of subterranean rock come closest to the earth’s surface. The initial artesian wells, drilled to 300-500 feet, had little success, but by 1880, a series of wells stretching as far as 1700 feet produced millions of gallons of water. The pressure from the flowing depths were strong enough to fill receiving reservoirs and twelve miles of street mains with 165 hydrants by 1881. Tests done by Charleston health officials on the chemical make-up of the water in the 1880’s proved that the underground water was cleaner than rain water, and the artesian wells on Calhoun and Wentworth street were a regular filling station for Charlestonians until Hurricane Hugo damaged the wells in 1989. One of the fascinating things that Charelstonians learned from the ever-flowing water, was that it varied in strength according to tides. Many of the artesian springs bubble up under the sea, and when the tides are high the pressure on top of the springs holds back the flow, so that it moves faster through other openings, and vice versa.